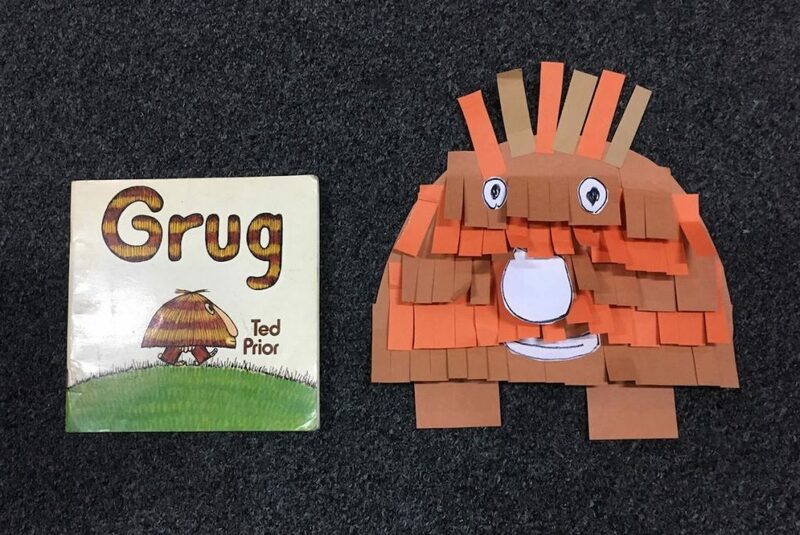 Today at recess I had a lovely surprise when a student from Prep PV popped into the library to read me the book she had written and illustrated about Grug. She also invited me to visit Prep PV where I found the whole class had spent the morning having lots of fun working as authors and illustrators. 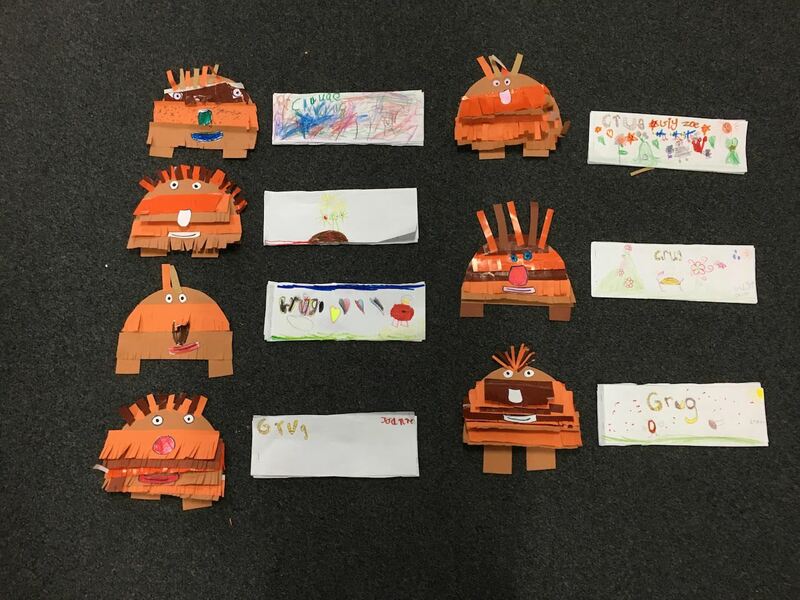 Mrs Vincent had read Prep PV the story of Grug and then the clever students had a go at writing and illustrating their own stories about Grug. There were lots of fabulous front covers, great ideas, neat handwriting, colourful illustrations and some books even had their own blurb at the back. 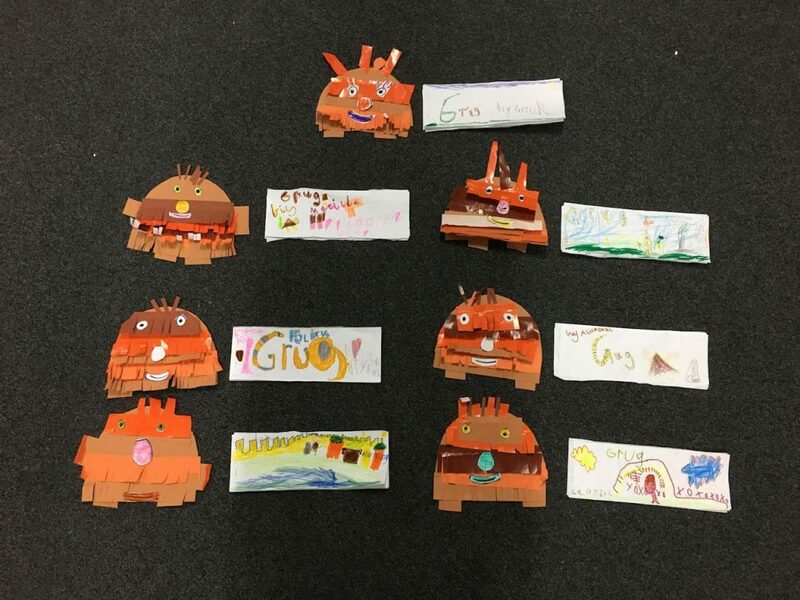 The fun didn’t stop there…everyone also made their own Grug character to go with their book! Thank you for inviting me to share your Grug stories today Prep PV and Mrs Vincent…you made my teacher librarian heart sing! Have fun reading your Grug story to your family! 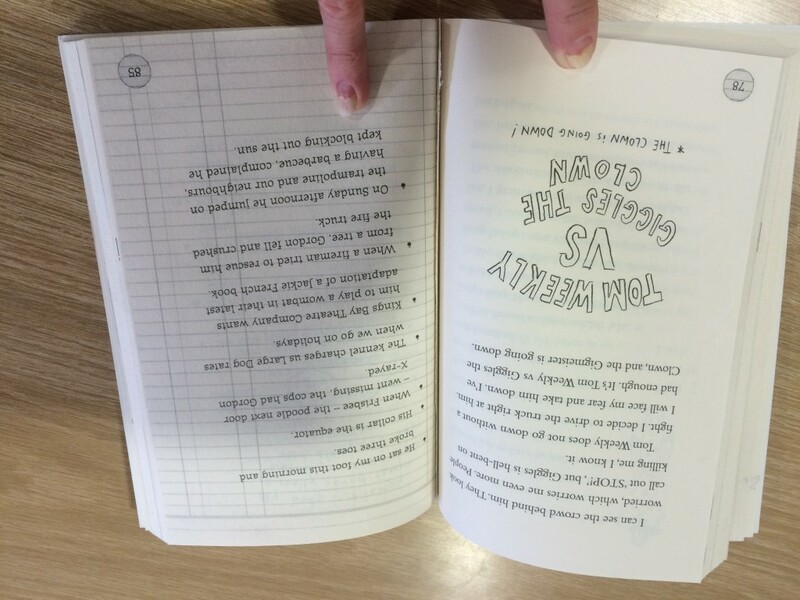 How did the pages of our book go missing? 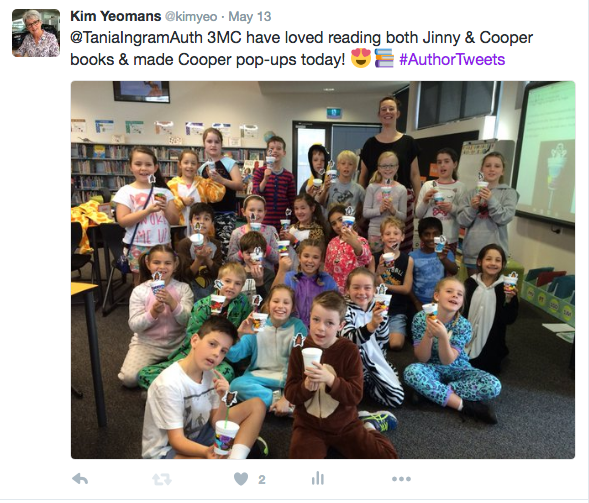 A few weeks ago as you know, I went along to an Author Afternoon Tea at The Little Book Room. I was excited to have our copy of Tristan Bancks’ latest book My Life and Other Exploding Chickens signed for our library. Three nights later on the Sunday night, I snuggled up on my couch to read Tristan’s new book before everyone else at school got their hands on it and I wouldn’t be able to borrow it for months! 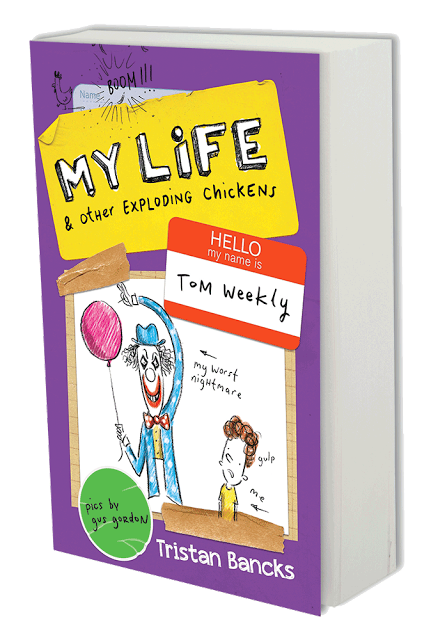 I laughed and groaned as I read Tom Weekly’s stories. 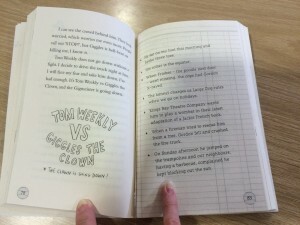 I was reading ‘Death by Clown’ and feeling sorry for Tom at the circus and his fear of clowns when I reached page 78 where Giggles the Clown had control of the remote control and was driving Tom towards a ring of fire and to my horror I discovered the story skipped to page 85!!! Oh no! Pages were missing! Who was going to win the battle of Tom Weekly versus Giggles the Clown?? At first I wondered if Tristan was playing a trick on his readers by leaving the last few pages out of his story. Then I looked a little closer and the pages hadn’t been left out, they had been RIPPED out of the book! How did that happen? Who would do that to a book? Leesa at The Little Book Room was as perplexed as me and kindly offered to replace our book. 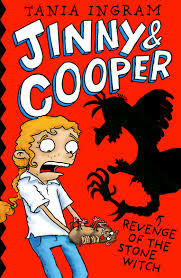 In the LRC that week I told the Year 3-6 classes about the mystery of the missing pages and we all wondered why someone would rip the pages out. We had fun listening to ‘Sit Where You Knit’ (some of us with grimacing faces and tears in our eyes) before I posted the book back. 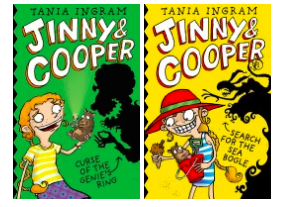 I then rushed out to buy another copy of the book so we would have two copies, but more importantly I had to see if Tom beat Giggles and also finish reading the remaining stories! (You can now borrow the book to find out too). On Saturday morning the mystery of our missing pages was solved! 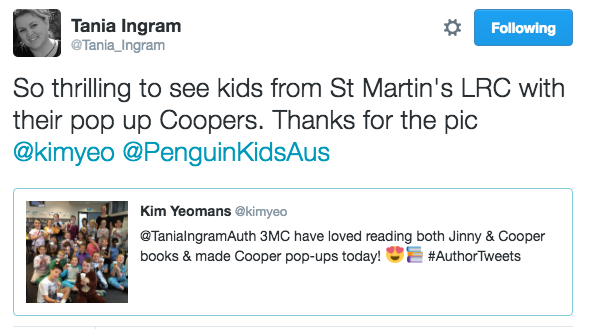 I watched the Kids’ WB show and their interview with Tristan Bancks at The Little Book Room. 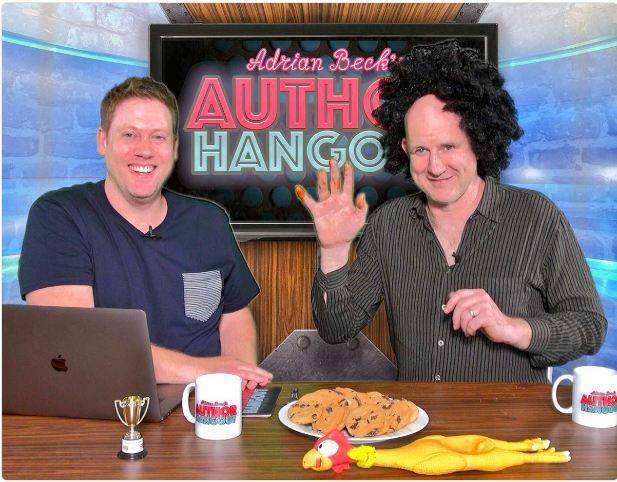 Adrian Beck, Shane Crawford and the Kids’ WB team had fun disguising Tristan so he could prank some kids in the book shop….Tristan was hilarious! 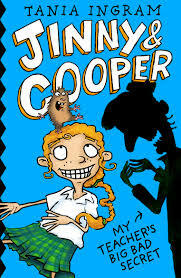 Some of the pranks Tristan did included ripping a copy of his new book in half, dropping an ‘original’ Wimpy Kid picture ‘accidentally’ into a fish bowl and ripping pages out of his book to eat! Yes he RIPPED pages out of his book! I laughed and laughed when I realised THAT must have been the book I picked up and bought and asked Tristan to sign!! What were the chances of me picking up that book? The mystery of the missing pages in our book has been solved and who would have thought it was the author who was the culprit! 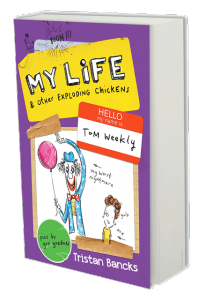 Now we have our own fun story to tell about My Life and Other Exploding Chickens…. 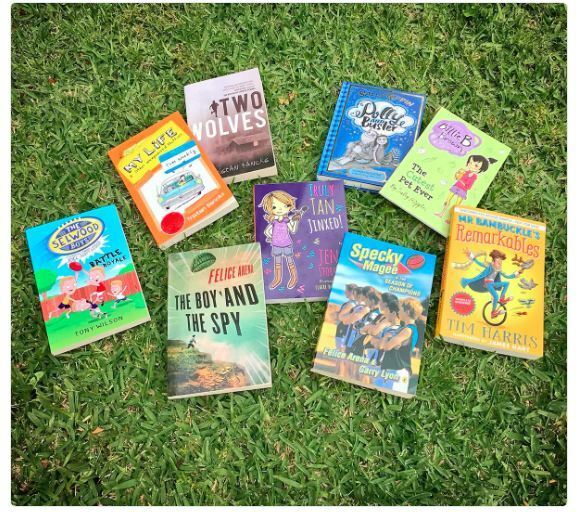 Last year (when they were in Year One), the Year Two classes had lots of fun tweeting and connecting with author Felice Arena as we read the books in his Sporty Kids series. So this year Felice and I had a surprise for them! 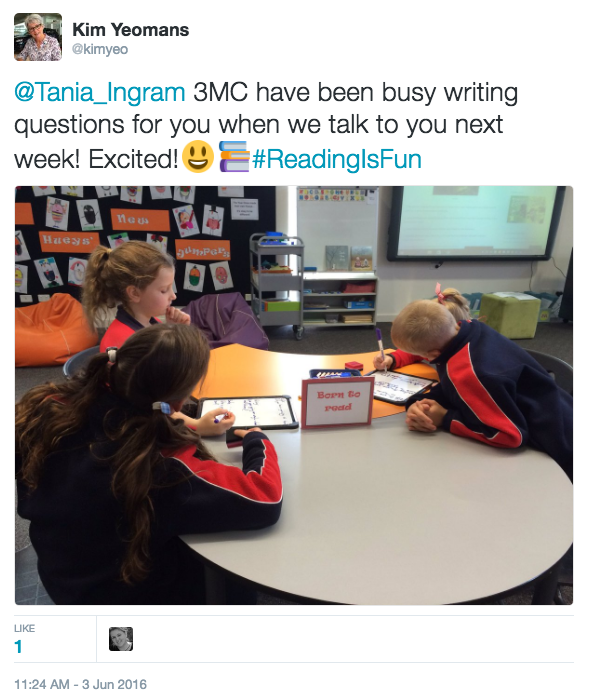 This morning the three Year Two classes came to the library with their teachers thinking I wanted to have a serious talk to them. You can imagine their surprise (and I think some of them were a bit shocked) when Felice appeared! What a wonderful hour the Year Twos spent with Felice! They had fun silently cheering on their very own Specky Magee in slow motion. Everyone listened closely as Felice read his Swimming book from Sporty Kids and some students even knew the story off by heart! 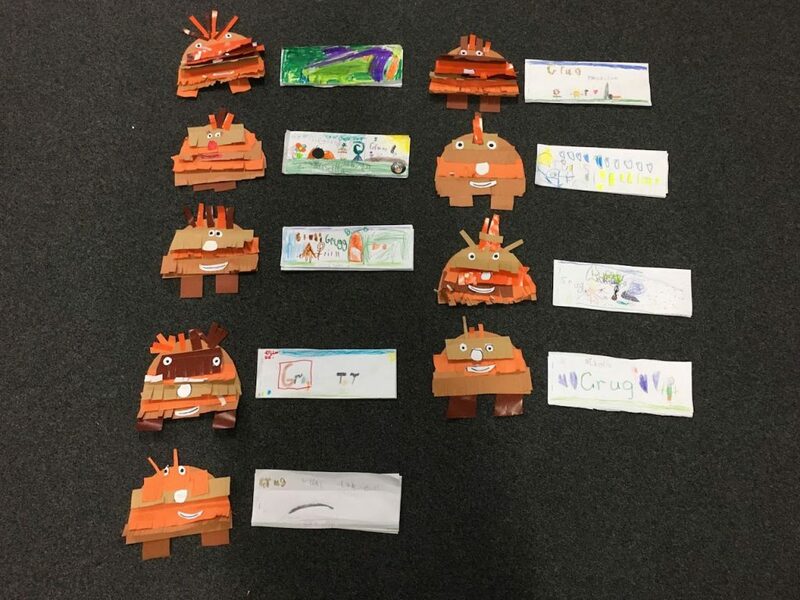 Felice told them about some of the other books he has written including Specky Magee, Andy Roid, Farticus Maximus (lots of laughs talking about this), Stick Dudes and his picture book Sally and Dave, A Slug Story (which translates differently in Chinese!). He also revealed that he had been an Art teacher and actor before becoming an author. Felice explained that listening to music as he wrote his latest book for older readers helped him think about the setting, plot and mood for his story. He played some of this music and asked students what they were thinking as they heard the music. I think we might have some budding writers in Year Two because their responses were very closely connected to Felice’s new book! Thank you Felice for coming to visit the Year Twos, and for bringing your books to life and making reading fun!